Chris Newsome took this image of Comet Swan on the 26th October 2006 when the comet appeared to increase in brightness. 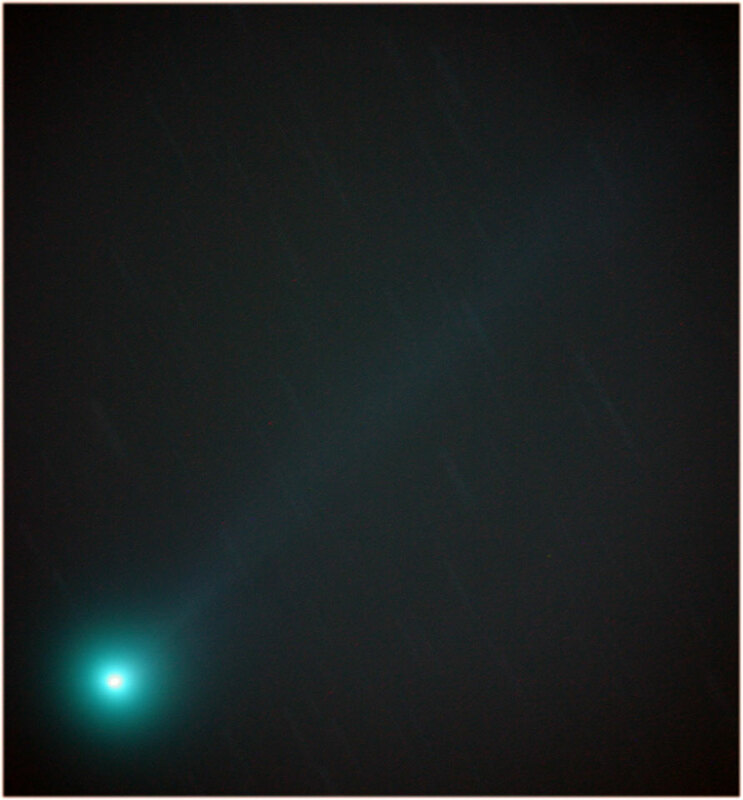 Chris used an 8” Celestron Newtonian and a Canon 300D DSLR camera to image the comet. He also used an Astronomik CLS filter to reduce any sky glow from streetlights etc. The exposure details were 15 x 180 second images at 800ASA, aligned and combined in MaximDL. Adrian Brown then used Adobe Photoshop Levels and Curves, Gaussian Blur filter and the Gradientxterminator filter to process the image. Adrian comments: "It was quite windy that day and Chris was struggling to stop the wind from buffeting his telescope. Apparently, he had to improvise a wind break from a duvet, a conservatory door and the tripod from his Meade ETX!" 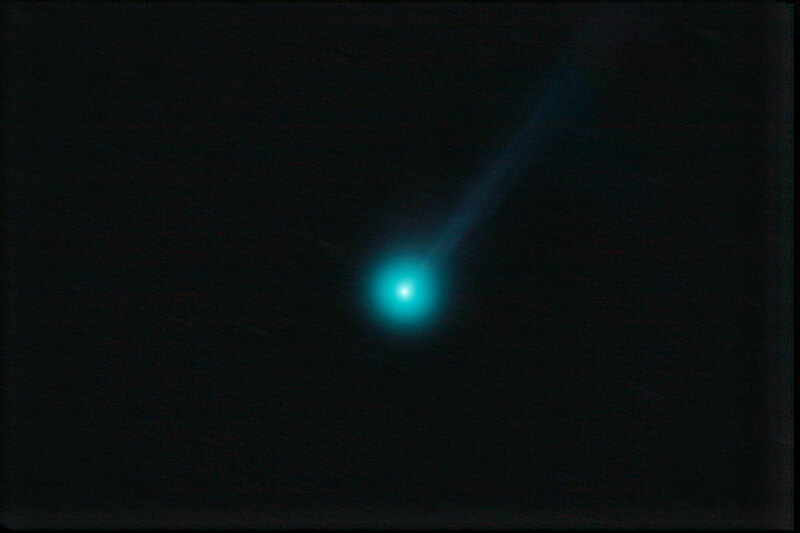 This is a re-processed version of the image of Comet Swan taken by Chris Newsome on the 24th October 2006. Details of the equipment used and the original image appear below. Adrian Brown has subtly emphasised structure and detail in the tail through the use of the curves feature in Adobe Photoshop. Chris Newsome took this image of Comet Swan on the 24th October 2006. It is a stack of ten 180 second images at 200 ASA taken with a Canon EOS300D camera through a Celestron C8-NGT telescope, guided by a Meade DSI camera through a Skywatcher 80T telescope controlled by a GPUSB running under MaximDL. Chris comments: 'That was the easy part. The difficult part was the processing! 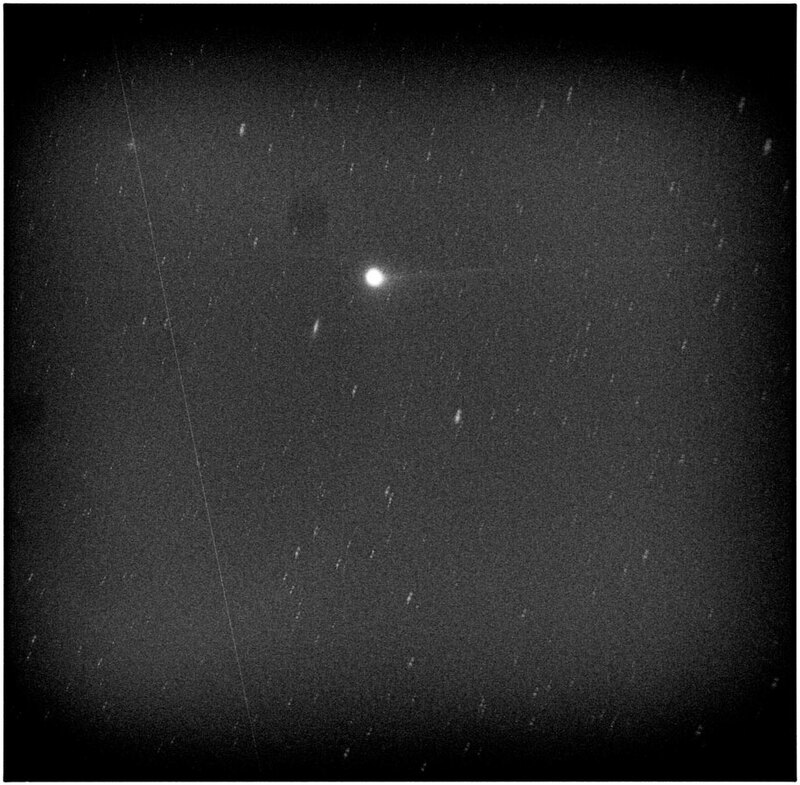 Firstly I stacked the 10 images on the comet's head which, due to the movement of the comet during the sequence of images, obliterated the background stars. I then stacked the same 10 frames this time on the stars which had the opposite effect on the comet. 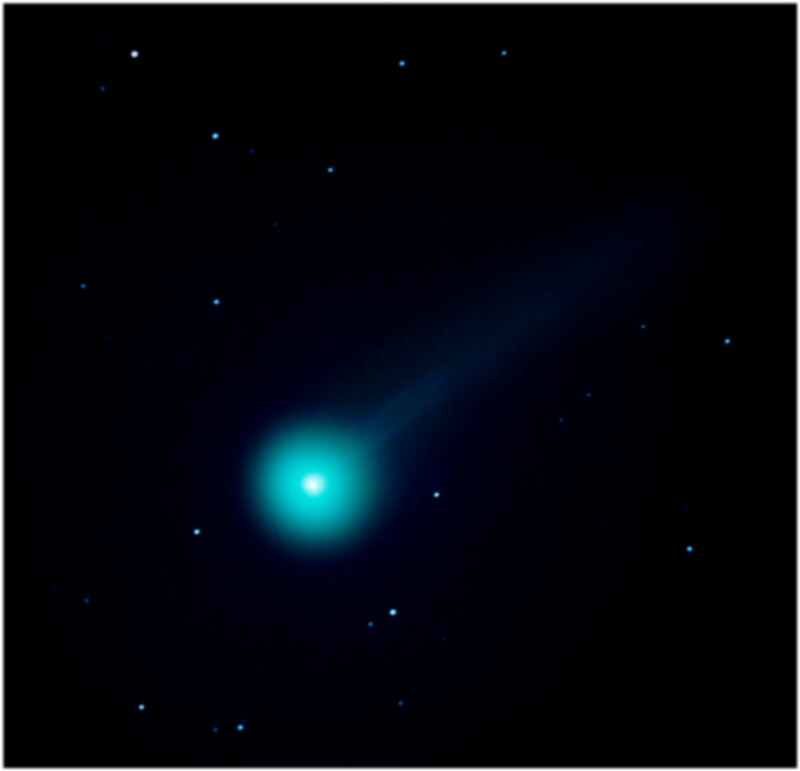 These two images were then layered in Photoshop CS2 to show the comet against a static background of stars. When the two layers were processed (using GradientXTerminator, RGB levels, curves and Gaussian blur), they were merged and converted from TIFF to JPEG format to produce the final result, taking about two to three hours to do!' The comet, on the 24th October, underwent a sudden increase in brightness from around magnitude 6.6 to about 4.5 and this was confirmed by observations from astronomers around the world and reported by the Society for Popular Astronomy via a circular on 25th October 2006. Adrian Brown has produced a re-processed version of this image which subtly emphasises structure and detail in the tail - above. The following image of Comet Swan was taken by Chris Newsome on the 9th October 2006 using a Canon EOS 300D camera through a Skywatcher 80T telescope. This set up was guided with a Meade DSI camera through an 80EDPro telescope controlled with a GPUSB interface and MaximDL. Eight images of 5 minutes each at 800 ASA were used (hence the grainy appearance of the image), combined with MaximDL, converted to greyscale and processed in Photoshop CS2. The bright object near to the head of the comet at the 8 o'clock position is Caldwell 29 (NGC 5005), a magnitude 9.8 spiral galaxy in Canes Venatici.